PowPowPow! indulges in fond memories of yesteryear, retro garb and the joy of spending last season in Whistler Blackcomb. Inspired by one man’s single handed effort to keep the art of retro alive and kicking, a group of ALLTRACKS Academy students dusted off the cobwebs from their onesies and turned up the awesome dial. All the way to max! 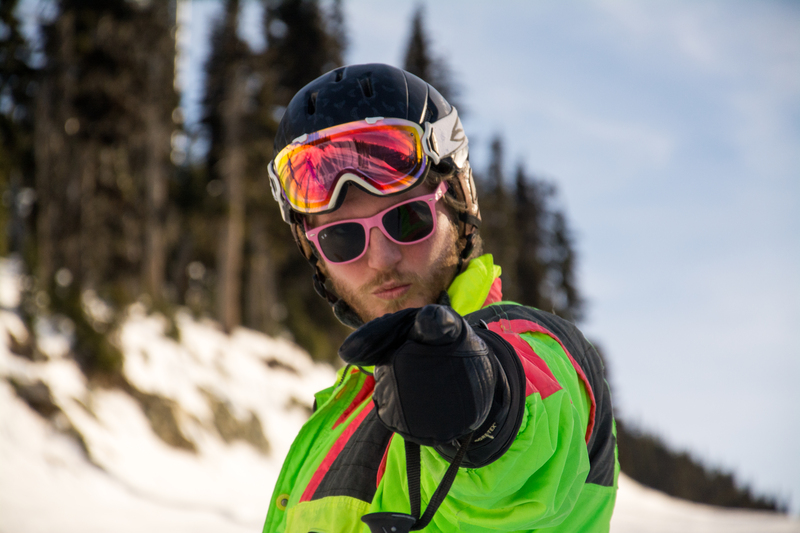 PowPowPow!’s, Ryan Davison Crisp, had the privilege to have a day’s photo-shoot with the class of Whistler Extreme. 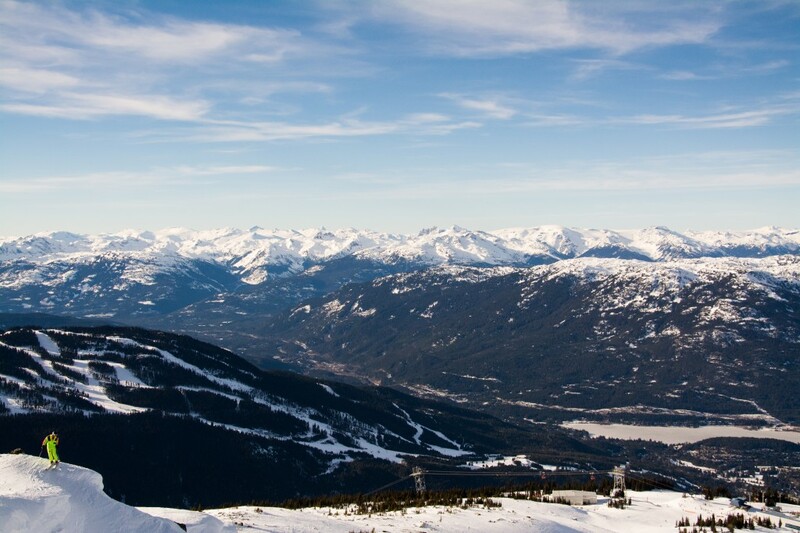 January 6th 2014 – Sat in The Westin hotel at the base of Whistler Village I am listening to Paul Beard, the owner of ALLTRACKS Academy of whom I am about to commence an eleven week training course, present a talk of what we can all expect over the coming weeks. There are many of us. Most of us are yet to become friends. A mix of excitement and nerves fill the air. I find myself losing track of what is being said, my attention diverted elsewhere in the room. From behind I glimpse the unmistakable blend of colours associated with my formative decade, the glorious Eighties. I look away and then double take. 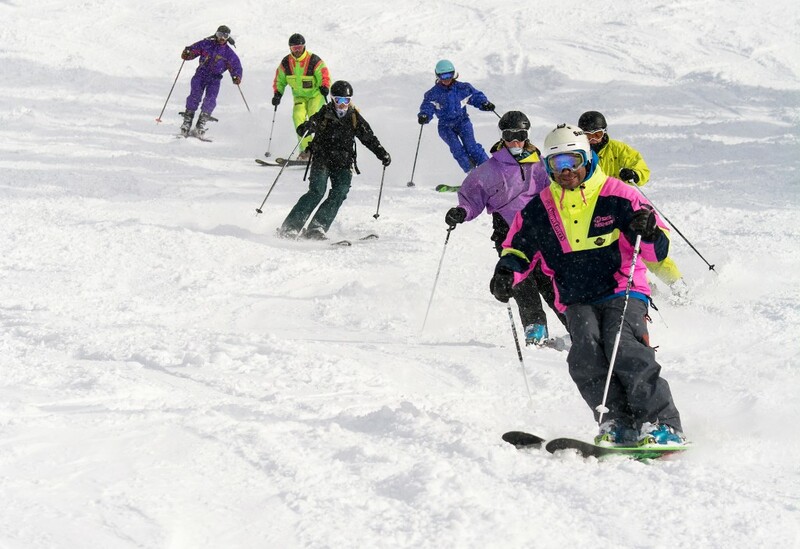 Yes, without doubt, a mere five or six rows in front of me a dude is wearing a retro Campri ski suit. The impossible clash of neon tones burn into my retinas, a dizzying feeling of late-Eighties/early-Nineties nostalgia the result. Wow, I think, I salute that man, he’s turned up to the briefing in fancy dress. Now before I go any further I think it proper to make a small confession here. Having recently turned 30 I am of a generation that clings to nostalgia like moths to a neon bar sign. Speaking on behalf of nearly all my friends, I think it fair to say that my generation in particular, more so than any other in my opinion, revisit their childhood on more than a regular basis. Is it because that golden era between the mid-Eighties to mid-Nineties was such a period of genuine awesomeness? Probably not. Is it because my generation have an intrinsic immaturity that can’t resist rearing its head whenever possible? Probably. Whatever the case, I care not. I am proud of the smorgasbord of cultural tat that many people of my age now look back at so fondly. I, for one, genuinely adore the many visual explosions that used to litter the skiing landscape. I love the movies of this period, demonstrated nowhere more perfectly than in The Blizzard of Aahhh’s and Aspen Extreme (if you haven’t seen, remedy post-haste). 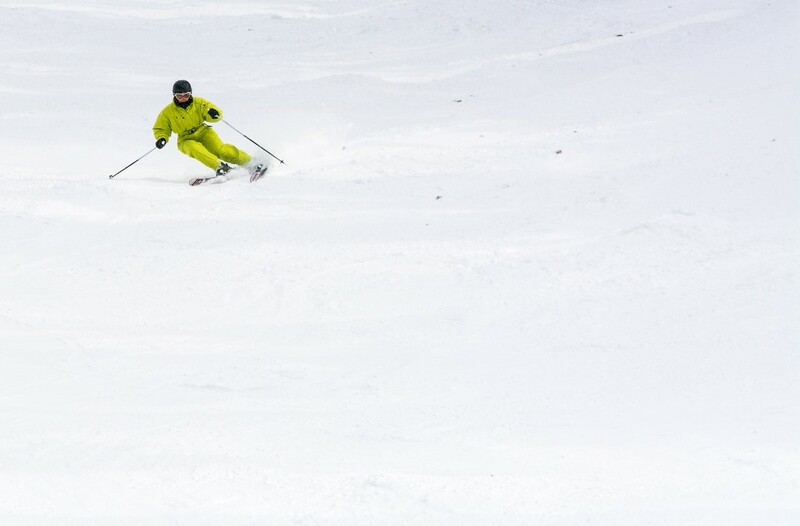 I admire those stellar individuals refusing to adopt contemporary ski technique, clutching aimlessly to their bum-wiggling, knees-together Euro Wiggle style, call it what you will. Honestly, it’s a thing of beauty. I salute the person that at the beginning of each new season thinks, you know what, this kit has served me well for twenty years so far, it’ll serve me fine this year too. So, therefore, I confess: I am an addict. I am addicted to all things ski kitsch. Nobby Norriss. Keeping the art of retro alive and kicking. Now then, getting back to the dude with the Campri colours glowing in front of me. I soon learned that this guy wasn’t in fancy dress. Heck no. Far from it. This was his genuine ski clobber. He was rocking a vintage Campri piece of kit and I was becoming seriously jealous. The kudos attached to my brand new shiny Arc’teryx get-up was fading by the second, weakened in the majesty of lime green and pink. It was inspirational. I wished I had the cojones to have had bought myself one prior to this trip. Turns out I wasn’t the only one inspired. I ended up grouped with this guy and our instructor, Nick Thomas, wasted no time in calling for a ‘Retro Day’. ALLTRACKS Academy was about to go back in time as everyone in my group’s eyes lit up like they were kids again on Christmas morning. Onesie day, you say? Hell yes we were game. But how would we onesie? Our instructor gloated that he was fine, he had one tucked away in the back of his wardrobe and would be more than delighted to not only dust that off, but also to bring out the old skinny skis as well. Holy mackerel, it was as if Nick had waited for this day for years and now it was here upon him he was going to embrace every minute of it. But what about the others? What about me? Worry not, also turns out that Whistler has a ReUse It Centre in which onesie wonders can often be found, genuine pieces sold for charity, but be quick we were warned, they apparently sell like hot cakes. Two of our group managed to get something rather fitting (in the literal sense), but sadly there was nothing for me. 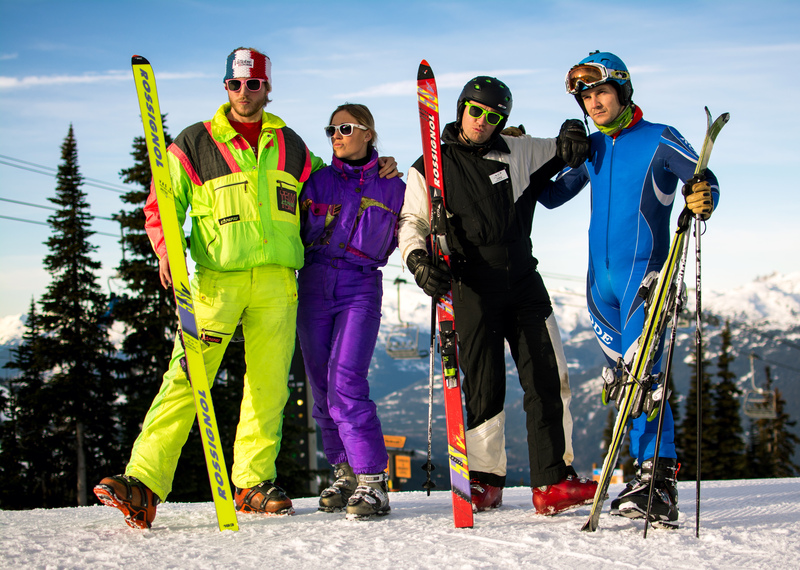 But with every cloud there is a silver lining, I would be the photographer for a day of ripping up Whistler Blackcomb in full retro glory. January 23rd 2014 – It has begun! The sounds of whooping and hollering fill up the wintry air from masses of admiring people on the mountain. 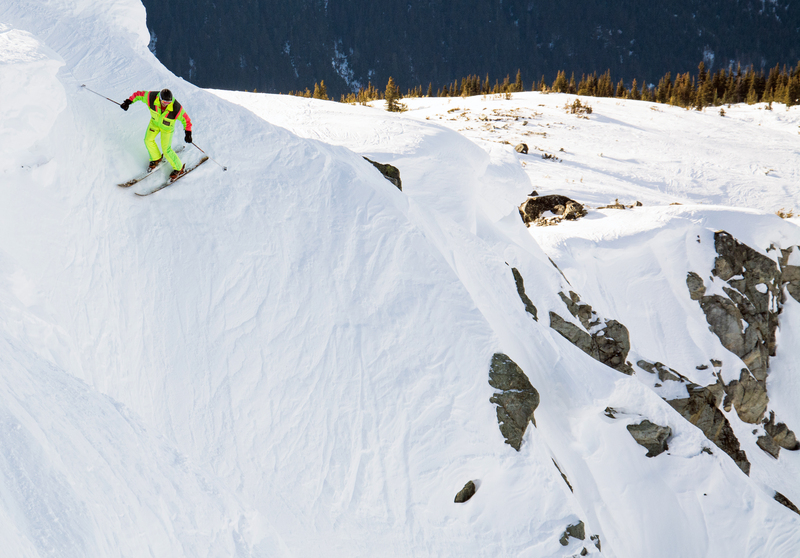 The members of Whistler Extreme are flying around the resort followed by their very own photographer, excited to document this adventure in its entirety. Before we actually begin skiing the gang are obliged to pose for a multitude of snaps, not only from myself, but also from wide-mouthed passers-by, confused and excited at what they were seeing. 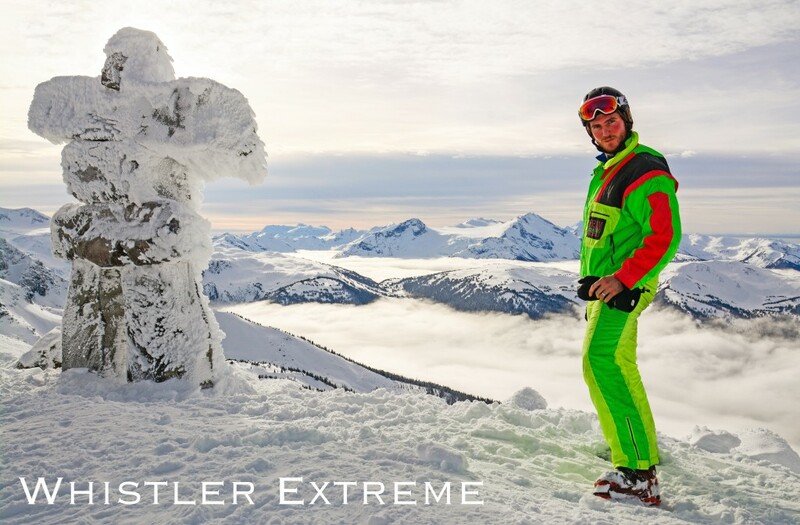 You might ask yourself “why Whistler Extreme”? The answer is simple. An homage of sorts to the wonder of Aspen Extreme, the 1993 Patrick Hasburgh movie. The guys all hoped to channel the spirt of Dexter Rutecki and TJ Burke. Schmidt and Plake were also in mind. Hot Dog The Movie. You get the idea. 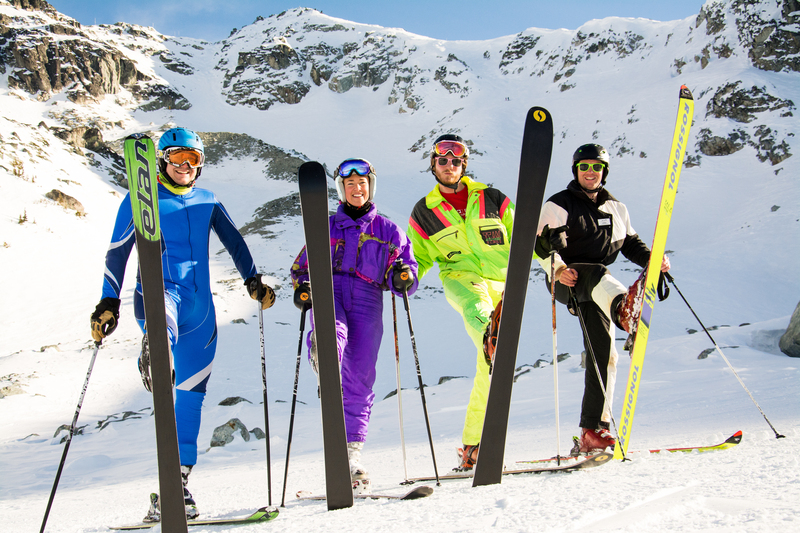 You see, the reality is that it’s not simply about the bright colours and revisiting the fashion trends we lived through and mostly learned to ski in. No, it’s about the whole package of ski nostalgia. Similar to how Hollywood is now saturated in 80’s remakes, much of my own generation are now the cultural creators in their very own right. This is not to say that originality is now a moot point, au contraire, the ski industry alone is awash with innovation. Take one look at the volume of clips pouring out onto the internet, consumed in an instant; jumps, big lines, humour, pow. We live in an age when the bodies of entertainment we consume and create can be unique, yet partnered with nostalgia. Nostalgia not at the conflict of originality, but at the side of it, another viable option to embrace our own experiences within the world of entertainment. The infantilism of my generation only acts as a means of liberation from the mundane. It is an intrinsic caveat well worth utilising every once in a while. Good for the soul. 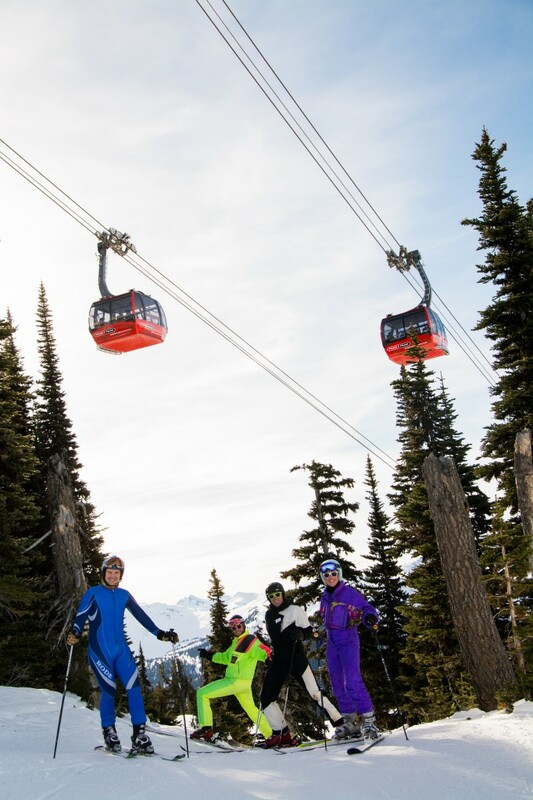 Such was the success of the inaugural Whistler Extreme that it wasn’t long before others wanted to get involved. A sequel was in the making. Whistler Extreme 2 seemed inevitable. The ReUse It Centre was frequented regularly, gems were unearthed, proudly sported by their buzzing new owners. 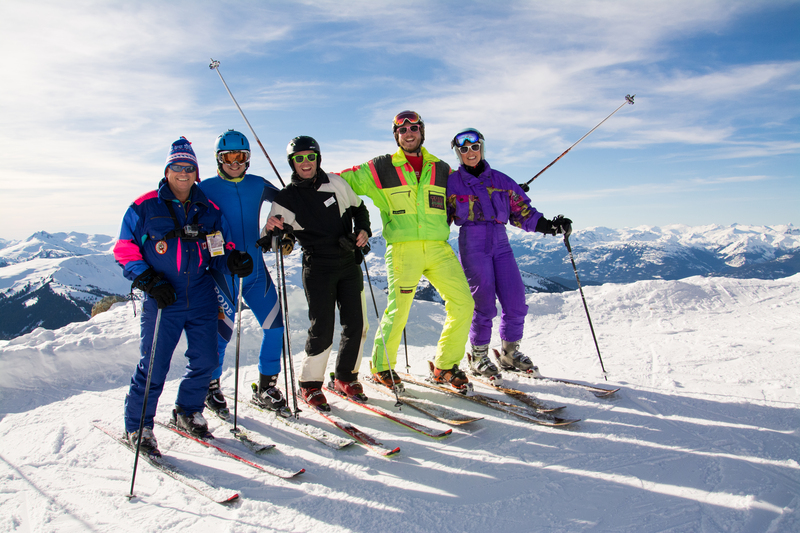 On both occasions students of ALLTRACKS channeled their inner retro, we could be seen ticking off many of the great runs on Whistler and Blackcomb. Day trippers and locals alike, often abruptly stopping to fully take in what they were seeing. 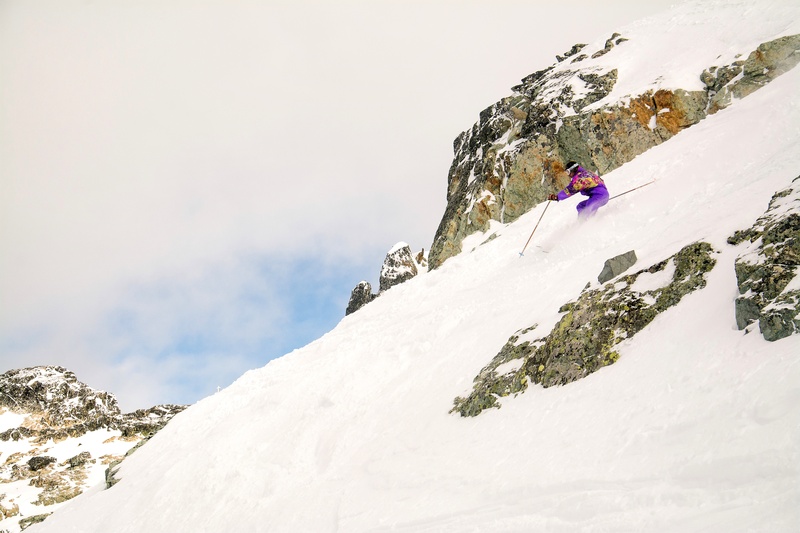 Hey, it’s not everyday you see a flash of lime green dropping into Bushrat or a man dressed in the snuggest of pink onesies launching down Couloir Extreme. We all love our chosen snowsports. Indeed, there’s little else most of us enjoy more. However, zipping up the lime green zip on the old Campri jacket and dropping down the neon pink glasses just adds an extra 25%. The awesome factor is dialled all the way to the max, spilling right off the chart. The envelope is pushed all the way into the mailbox. Don’t believe me? Try it. Rock out the onesies this season. Get your friends on board. Up the ante. Enjoy the blast from the past. I promise your enjoyment will be increased by the power of retro. 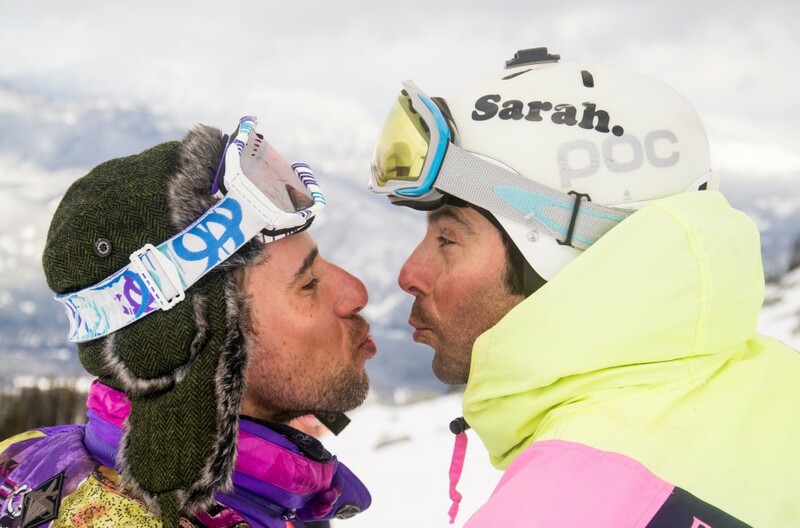 Pow lovers unite. Hug a onesie wearer that has left their irony at home. Get your own. Darn it, go crazy, accessorise that bad boy up with bum bags, head bands. Heck, what about a monoski? Party like it’s 1989 and trust in the power of retro. 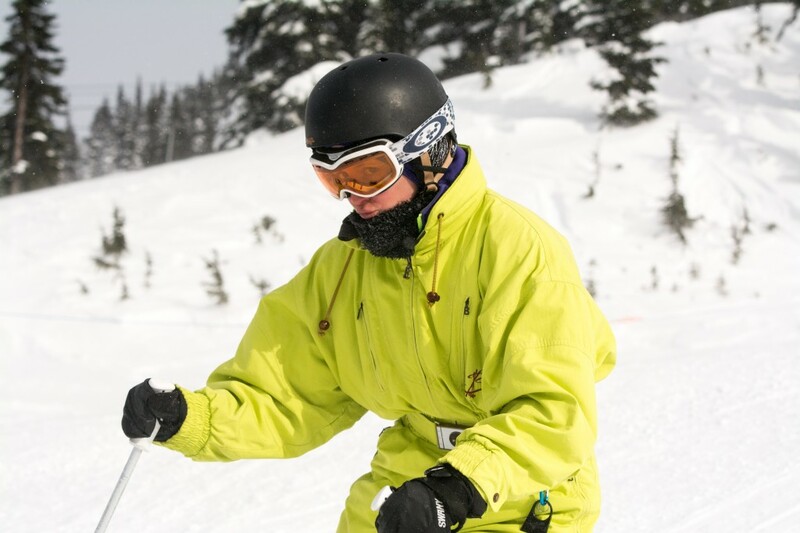 As I sit here in Whistler once again, in the early stages of a new season, these retro memories bring me such joy. I wonder, indeed hope, that the new friends I am about to meet this season as many of the new ALLTRACKS Academy students roll into town, share some of these same sensibilities. I’m pretty confident they will and in no time at all, these two famous mountains will be hosts to a cacophony of retro, impossible colour combinations, happy faces, collectively celebrating something all too pure with our beloved wintry pastime: the very soul of skiing and boarding – joy. To all those Nobby Norriss’ of the world. Keep on rocking the retro. We salute you. PS: We hope that some of the images shared here inspire you and your friends to channel your own inner retro this season. For those in Europe this season, check out Retro Rentals (http://retro-rentals.eu). Alternatively, eBay is always a good source to uncover your own retro wonder. She’s usually full pizza. In retro, she’s a shredder! The original team. Nobby, Nick, Rob & Helen. The world needs heroes!